Nursing home arbitration agreements get a bad rap. But as most practitioners in the field know, nursing facility arbitration agreements seem here to stay, at least (possibly) until recently. Arbitration is thought by many to offer significant flexibility and efficiency vis-à-vis litigation, and proponents in the skilled nursing industry cite arbitration as an important tool to reduce litigation costs – including, of course, the costs associated with “runaway jury” punitive and noneconomic damages verdicts, which can be crippling to industry participants. The enforceability of nursing facility arbitration agreements has long been a hotly contested issue. It probably is fair to say that, in general, courts broadly view these agreements as enforceable in a vacuum, but they will approach any particular instance with a healthy degree of skepticism. Occasionally, state courts have tried to go one step further than analyzing and rejecting nursing facility arbitration agreements on an ad hoc basis and have announced a per se rule against enforceability of such agreements. That typically does not end well for those courts. The relatively recent Marmet decision is a good example of this latter scenario. There, the West Virginia Supreme Court issued a decision in a consolidated group of cases holding that pre-dispute nursing facility arbitration agreements were void as against public policy under state law The decision was appealed to the U.S. Supreme Court, which granted certiorari and promptly slapped down the state court. In a (relatively) scathing per curiam opinion, the Court emphasized: “As this Court reaffirmed last Term, ‘[w]hen state law prohibits outright the arbitration of a particular type of claim, the analysis is straightforward: The conflicting rule is displaced by the FAA.’ … That rule resolves these cases. Since that decision, state courts seem to be somewhat more receptive to honoring and enforcing nursing facility arbitration agreements. In 2016, however, federal regulators attempted to throw a curveball to the skilled nursing industry. On September 28, 2016, the Centers for Medicare and Medicaid Systems (“CMS”) announced a new rule ostensibly intended “to make major changes to improve the care and safety of the nearly 1.5 million residents in the more than 15,000 long-term care facilities that participate in the Medicare and Medicaid programs.” As part of this new rule, which would go into effect on November 28, 2016, CMS banned the use of pre-dispute arbitration agreements by nursing homes on a going-forward basis. It noted that the rule did not apply to existing arbitration agreements (thus avoiding running afoul of the Federal Arbitration Act), and it specifically allowed nursing facilities and plaintiff-residents to agree to arbitrate after a dispute has arisen. But the sort of prospective arbitration agreement that is presented to residents and potential residents at the time of admission would be prohibited from now on. Although the rule technically only applied to nursing homes that accepted Medicare and Medicaid funds, as a practical matter, that included virtually all such facilities. Needless to say, this was a controversial measure. And the industry did not take it lying down. On October 17, 2016, a group of trade organizations and nursing facility operators filed a lawsuit in the U.S. District Court for the Northern District of Mississippi challenged the pre-dispute arbitration rule. On November 7, 2016, the court ultimately agreed with the challengers and entered an order preliminarily enjoining it. It held in relevant part that a federal agency regulation effectively banning a certain type of arbitration agreement, even on a prospective-only basis, would be flatly inconsistent with the overarching pro-arbitration policy and purpose embodied by the FAA. On December 9, 2016, CMS capitulated and sent a memorandum to Medicaid state survey administrators announcing that the rule should not be enforced unless and until the litigation was resolved and the injunction was lifted. Especially in light of the change in administrations, the ultimate status of the pre-dispute arbitration rule is uncertain at best, and it is currently not being enforced. So where does that leave nursing facility arbitration agreements? Are facilities free to include them in admissions packets without fear that they will be unenforceable? The answer to those questions necessarily is a qualified one. Pre-dispute nursing home arbitration agreements still are not unenforceable per se, but at the same time, they will be looked upon with varying degrees of skepticism by courts. As noted above, many post-Marmet state courts seem to have gotten the message that animus towards nursing home arbitration agreements will not be tolerated by the federal judiciary. But “many” does not mean “all” (or even, necessarily, “most”), and there are still a number of states and jurisdictions in which courts appear likely to continue to go out of their way to find reasons as to why any particular arbitration agreement should not be enforced. As such, it is crucial that any nursing facility or operator of facilities that wants to institute (or continue to use) an arbitration program go to great lengths to dot every “i” and cross every “t” when offering residents the opportunity to enter into an arbitration agreement. This includes proactively reviewing the form arbitration agreement currently in use to ensure it complies with state contract law requirements, and training admissions staff so that the avoid typical pitfalls when presenting arbitration agreements to residents or prospective residents to sign (e.g., making sure that the resident has capacity to sign or that there is sufficient documentation for a representative to sign on behalf of that individual, making sure that the agreement is properly witnessed and countersigned, etc.). Litigation over the arbitrability of a nursing facility dispute can itself be so costly and time-consuming that it removes many of the efficiencies and related advantages of arbitration. As is usually the case, it is best to try to address that potential issue on the front end of things. The United States Supreme Court refused to review a decision by the Oklahoma Supreme Court denying a nursing home’s request to arbitrate a wrongful death claim with a resident’s family members. Thus, the Oklahoma Supreme Court’s decision will stand: family members of a deceased nursing home resident will not be required to arbitrate because they did not sign the arbitration agreement in their personal capacities and their claim is not wholly derivative of the former resident’s claim. Most nursing home arbitration agreements have language stating that the agreement binds a resident’s spouse and heirs, whether or not any claims are brought on behalf of the resident, and that the agreement covers wrongful death claims. Whether or not a court will enforce a provision that heirs arbitrate claims has been the subject of much litigation. In Boler v. Security Health Care, LLC, the Oklahoma Supreme Court examined cases from other jurisdictions that considered whether a decedent’s heirs are bound by an arbitration agreement signed by or on behalf of the decedent. The Oklahoma high court noted that in states that consider wrongful death actions to be independent and separate causes of action, courts are more likely to hold that beneficiaries are not bound by the arbitration agreement. In contrast, the Oklahoma Supreme Court noted, beneficiaries are more likely held to be bound by a decedent’s agreement to arbitrate in states where wrongful death actions are wholly derivative of the decedent’s claims. Noting that Oklahoma’s wrongful death act created a new cause of action for the losses of the deceased’s spouse and next of kin and that recovery does not go to the estate of the deceased, the Oklahoma Supreme Court explained that wrongful death claims in Oklahoma are not wholly derivative claims. Thus, the court held that a decedent cannot bind beneficiaries to arbitration. Colorado has taken a different approach from Oklahoma even though Colorado’s wrongful death act also creates a separate cause of action. Colorado’s Supreme Court did not analyze whether a wrongful death claim is wholly derivative or not in deciding whether a decedent can bind his or her heirs to arbitration. Instead, Colorado’s high court in Allen v. Pacheco turned to contract law. Thus, the court examined whether the parties intended to bind a spouse to arbitrate a wrongful death claim. Examining the plain language of the arbitration agreement, the court concluded that the agreement required a spouse to arbitrate her wrongful death claim. While there is no way to guarantee that a court will enforce an arbitration agreement, this discussion illuminates the importance of knowing the nuances of arbitration case law in order to draft the strongest arbitration agreement possible. It is also advisable to review arbitration agreements periodically to determine whether they should be modified due to developments in the law, particularly evolving case law. On January 23, 2015, the Centers for Medicare and Medicaid Services (CMS) revised surveyor guidance regarding Cardiopulmonary Resuscitation (CPR) in nursing homes. The guidance clarifies a facility’s obligation to provide CPR. CMS requires that nursing home staff maintain current CPR certification through a CPR provider whose training includes hands-on practice and in-person skills assessment. Online-only certification is not sufficient. However, the program may have an on-line knowledge component if it also requires an in-person demonstration or skills assessment to obtain certification or recertification. The revised surveyor guidance also incorporates CMS’ prohibition against a facility-wide “no CPR” policy because this may prevent implementation of a resident’s advance directives and does not meet the quality standards found in 42 C.F.R. § 483.20(k). 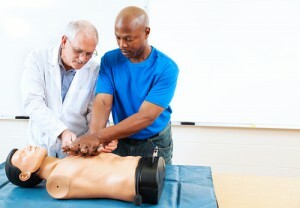 If a resident experiences a cardiac arrest and does not show obvious signs of clinical death, facility staff must provide basic life support, including CPR, prior to the arrival of emergency medical services in accordance with the resident’s advance directives or in the absence of any advance directives or a Do Not Resuscitate Order. Finally, the guidance reiterates CMS’ requirement that CPR certified staff must be available at all times. The Centers for Medicare and Medicaid Services (CMS) announced that it will reveal its new Nursing Home Compare 5-Star Quality Rating System to the public on February 20, 2015. CMS will change its ratings to raise the bar for achieving a high rating in the Quality Measures category. Thus, ratings will likely fall for many nursing homes even though there has been no change in the quality of care. CMS is raising the standards for nursing homes to achieve a high rating in the Quality Measures category by increasing the numbers needed to achieve a particular star category. According to CMS, in 2008 the initial scoring for the Quality Measures rating was set at a distribution that reflected the status quo with the expectation that there would be progress and changes to the quality measures thresholds over time. When nursing homes have made progress in raising performance standards, CMS resets the distribution to promote further progress. Additional Quality Measures: CMS added two additional quality measures for antipsychotic medication use in nursing home residents without diagnoses of schizophrenia, Huntington’s disease, or Tourette syndrome. Staffing Algorithms: CMS adjusted these measures to more accurately reflect staffing levels. Survey Expansion: CMS announced a plan for State Survey Agencies to conduct specialized, onsite surveys of a sample of nursing homes in the country to assess the adequacy of resident assessments and the accuracy of information reported to CMS that is used to calculate quality measures. These changes to the 5-Star Quality Rating System are the third major revision to the Nursing Home Compare website since it was launched in 1998. CMS says that a fourth change is scheduled for 2016.